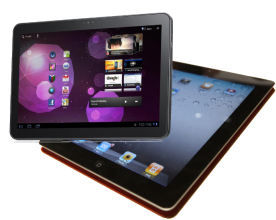 An interlocutory injunction was sought by Apple, to put a stop to Samsung’s plans to launch the Galaxy Tab 10.1 in Australia on 11 August 2011. Apple’s claim is based primarily on allegations that the Samsung tablet infringes Apple’s Australian standard patent nos. 2008201540, 2005246219, 2007283771, 2009200366 and 2007286532, along with innovation patent nos. 2008100283, 2008100372, 2009100820, 2008100419 and 2008101171. The patents relate to various touch-screen user interface features. the Galaxy Tab 10.1 device. It seems highly unlikely that Apple would have got its injunction. Interlocutory injunctions are notoriously difficult to obtain in patent cases of this type, since the patentee needs to establish not only that they have a strong case, but also that an alternative remedy at a later date – such as damages or an account of profits – would not provide adequate compensation for any infringement that occurs pending a decision in the matter. It is not credible that Apple could establish a strong enough case to justify an injunction based upon alleged patent infringement by a product that has not even hit the market yet. Counsel for Samsung has been reported as saying that Apple’s action is founded on the assumption that the Australian version of the Galaxy Tab 10.1 is the same as the US version. Samsung says that the Australian version will be different. Furthermore, an award of damages after the fact would clearly be an adequate remedy if Samsung is found to infringe Apple’s patents. The presence of the Galaxy Tab 10.1 on the Australian market is not going to drive Apple out of business before the case can be decided! The court will not restrain a party from trading in a product prior to a full trial unless there is an extremely good reason to do so. This Australian action by Apple must be seen the the context of the global dispute currently underway between itself and Samsung. As has been widely reported, the companies are engaged in litigation in at least nine countries including the US, Germany, Britain, France, Italy, the Netherlands, Japan and South Korea. With those markets at stake, this action in Australia is at best a strategic move by Apple, and at worst a mere sideshow, nothing more than a brief storm in a teacup. Patent litigation in Australia is much cheaper than in, say, the US. However, when considered relative to the size of the market it is actually very expensive. It therefore does not make much sense for Apple to expend resources in this country when they can obtain better value elsewhere. long before any resolution in the Australian case, Samsung and Apple will settle all of their suits on a worldwide basis. So do not worry, Aussie folks – you will shortly be able to acquire that Galaxy Tab 10.1 that you have been admiring from afar! People,, it is time to exercise people power and stand against the gestapo style behaviour of the Apple company. I have a Samsung smart phone, and it clearly states that it is a Samsung on teh front and the back of the phone. The phone feels like any other phone that I have had weather it was a Nokia, Lg, Panasonic or a Sagem. I can say that Apple are more about safeguarding their profits than they are about providing a competitive product, they are scared at the moment and so they should be. The rest of the world has caught up with the technology. The Samsung product must be a serious threat for Apple to want to take this kind of negative action. Time for their customers to be negative toward this company. Before you buy an Apple product look at where it comes from, look at the amount of workers that have suicided, look at the workers conditions where they are treated like battery hens, forbidden from speaking while they are working for 10 hours a day, threatened with the sack, threatened that their jobs will be replaced with robots if they don't work hard enough. Is this the kind of company that you want to support? All of these products are made at the lowest cost to the company (in China of course) so look for alternatives. My article does not address the 'misleading and deceptive conduct' allegations, which Apple apparently also raised (although it seems as though it has been Samsung's legal team playing this up in the media). This is a standard ploy in almost every intellectual property action, and amounts to saying 'since you are copying my good ideas, you must be pretending to be me!' This is clearly a false proposition in this case. Samsung has no interest in Galaxy Tabs being mistaken for iPads. They have established a strong and successful brand, and they want consumers to see them, rightly, as legitimate and distinct competitors to Apple. Patent rights are a different matter, however. You can stop someone from using your patented technology even if they are not imitating you or did not intentionally copy. But this is a war Apple cannot win. Apple owns 121 Australian patents. Samsung owns 704. Last year, Samsung was the #2 recipient of US patents, after IBM, with 4551 patents issued to it in 2010. Apple came in at #46 with just 563. Of course, Samsung has a much broader product portfolio, so not all of its patents relate to mobile communications technologies and smartphones. But many do, and importantly some of those relate to fundamental aspects of wireless communications. Apple's patents cover pretty UI features, i.e. stuff that can be altered in software without turning the tab into a brick. In theory, Samsung could probably force Apple to turn off 3G! Personally, I think the 10.1 looks great. I might even buy one when it is released. Thanks so much for your informed reply. I too had the decision to make between the different telephones available here (I live in Bangkok, Thailand) and it seems that almost everyone here has either a Black Berry or an Apple. When I looked at what was on the market, the decision was not all that easy, but the winner after careful consideration and research was the Samsung. For price and ability it was streets ahead. I to am now waiting for the 10.2 to arrive. The deceptive conduct, does this mean the allegations that Samsung have been advertising, or saying that the Samsung product is better than the Apple product. I have read things about this on the online papers, it all seems a bit funny to me. I would have thought that making a statement like that (all being true) is completely fair in an open market. You are correct. 'Comparative advertising', so long as all statements are true, is completely fair and legal. As far as I am aware, Apple is not complaining of unfair competition in the form of deceptive advertising. The complaint (which, in my view, is not sustainable) is that the Galaxy Tab 'looks and feels' so much like an iPad that consumers might be decieved or confused into thinking it actually is an iPad. This is nothing but an 'ambit claim'. It should not be taken too seriously. have already been don’t before . when the iphone 5 comes along. Thanks for your comment, Dylan. I have taken up some of the issues you (and Google) raise in my latest post - http://blog.patentology.com.au/2011/08/apple-v-samsung-google-says-its-all.html.